Why the revolutionary musical will not be stopped. Illana Zauderer, Singer, Actress, Artist, Sleep-enthusiast. Thursday night, San Francisco finally got its Hamilton. The show, a Tony-Award-Winning sold-out hit in New York City where some tickets have gone for upwards of $2,000, has been in previews here in the Bay Area since March 10th, and will run into August. Tickets are essentially gone, although you can still nab some for upwards of $800 or some seats that have obstructed views. There’s also a regular online lottery for a few tickets, for which you need to register the day before the show. If you don’t have any yet, should you try to get tickets? If you do have tickets, will it live up to the hype? Does it make any sense that people all over San Francisco sat in front of their computers for hours on the day that tickets went on sale, not budging for food or basic needs until their assigned minute for seat selection and purchase arrived? It does, My Friends, it does. The show is exactly as good as everyone is saying it is. I’ve thought about the show a lot since last Sunday, when my family and I went to see a preview performance. Here are my best guesses as to what makes this show into a phenomenon that shows no sign of slowing down. First, the story grabs you. Alexander Hamilton, born in the British West Indies, came from nothing and became integral in Something. The show takes you inside: the Founding Fathers are here creating something new in America, and you feel the passion of young men (and women) who want to stand for what’s good and right, to leave a legacy the value of which they may not even see in their lifetimes. There is Hamilton’s personal story, a compelling narrative of a young man in dire circumstances (his father left, Hamilton and his mother were sick, she died while holding him, he had nothing to his name,) but was recognized by his island community as gifted and so was sent to America. We learn his love story with Eliza Schuyler, and the very human expression of what happens to people when they are in pain and bump into each other. There is the layer of resonance of this revolutionary story today: America is a country built by immigrants. Still. Then, the music and the lyrics. How is this brilliance born? 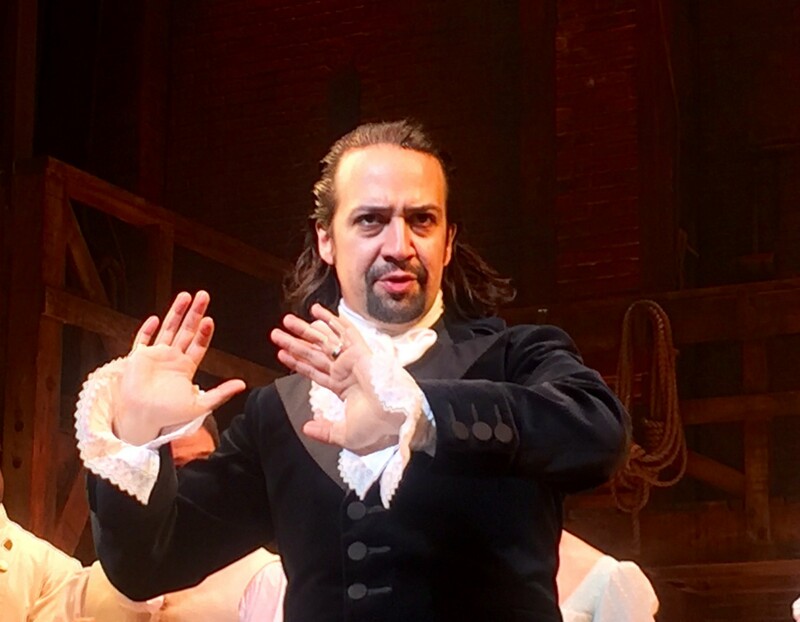 Somehow Lin-Manuel Miranda, creator and title-star of the original Broadway show, wrote just the right combination of melodic musical scale: there is classical strategy behind the harmonics of the music, so that your ear (and therefore your heart) will follow the music from a consonant, recognizable and hummable piece to a dissonant moment. This is how he keeps you in his pocket as he builds musical interest and intensity, and how he spins your emotions. And Miranda takes you everywhere. He incorporates elements of traditional musical theater — classical ballads, vaudeville numbers, comic relief at just the right time, toe-tapping tunes for when you leave the theatre, and 11-o’clock numbers. The music is exactly what is needed at all times to continue pushing the story along. As the audience, there is no resting for us in this musical — there is no section that is just boring enough so that you can sit back and take yourself out of the story for a minute to think about what is on your to-do list tomorrow. You are in this experience and you don’t get out until it’s done. But at the same time, the music is modern. It’s the best of hip-hop and rap, and not so much that you want to turn your head away. Miranda has included just enough current language to be extremely clever and effective. While grounding us in traditional musical theatre, his modern musical elements force us to experience the show’s relevance in a way that some classic (and still beautiful) musical theater doesn’t. There is no escaping this show. Then, the dancing, which is mind-blowing in its effectiveness. Who is this Andy Blankenbuehler?? He has created genius. The choreographer, who has been with Miranda since his first musical, In the Heights, has incorporated the dancing throughout the show but also manages to make sure it isn’t lost. Hamilton is a sung-through, danced-through musical. You won’t separately experience action, then music, dialogue, then dance; it is all happening all the time. You’ll certainly see larger dance numbers that involve the full cast at times, and plenty of synchronized, impressive patterns carried out by a very tight chorus, but there are many scenes where the dancers somehow slip in and out such that you don’t notice the dancing as its own, but instead you feel the difference in the moment — Blankenbuehler is adding to your theatrical experience in a way that makes the room feel 5-D.
And the performers. The phenomenon of Hamilton is well-known around the globe, so it’s no wonder that the best of the best have auditioned for the current and future companies. The performers are smart enough to know that this is a remarkable vehicle for a lot of talent, and that they just might have landed the job of their lifetime. This cast is hands-down the tightest, most skilled and highly committed cast I’ve seen in San Francisco. The actors are believable and artful, the dances are perfectly synchronized, the voices are pure, trained and raw at the same time. The sweat pours, and that’s how it will be whether you saw a preview, opening, or are planning for a matinée. My son and I have followed the trajectory of Hamilton since it opened in New York; we are some of the folks who bought the soundtrack early, watched the making-of documentary, “Hamilton’s America,” on PBS, and are devoted Lin-Manuel Miranda groupies. Miranda has teased that, while he’s no longer in the Broadway company, he just might drop-in on one of the touring productions and join the cast for the night. We were certainly wishing against hope that our preview might be one he would visit, for a moment stepping back into the role he ignited in the phenomenon he birthed. He didn’t show. It didn’t matter. My family and I still cried — me from the moment the orchestra began until the final bow. Go see it. Be changed.